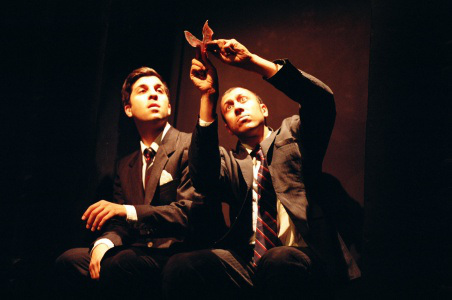 Trained at the École Jacques Lecoq in Paris, Toronto-based performer, director, writer and producer Adam Paolozza co-founded the company TheatreRUN in 2003. Since then, his innovative and sometimes quirky productions – many of them produced in collaboration with other Toronto theatre companies – have included the Dora-award-winning Spent (2009), Artaud: un portrait en décomposition (2011), and most recently The Double (2012), adapted from Dostoyevsky’s novella. 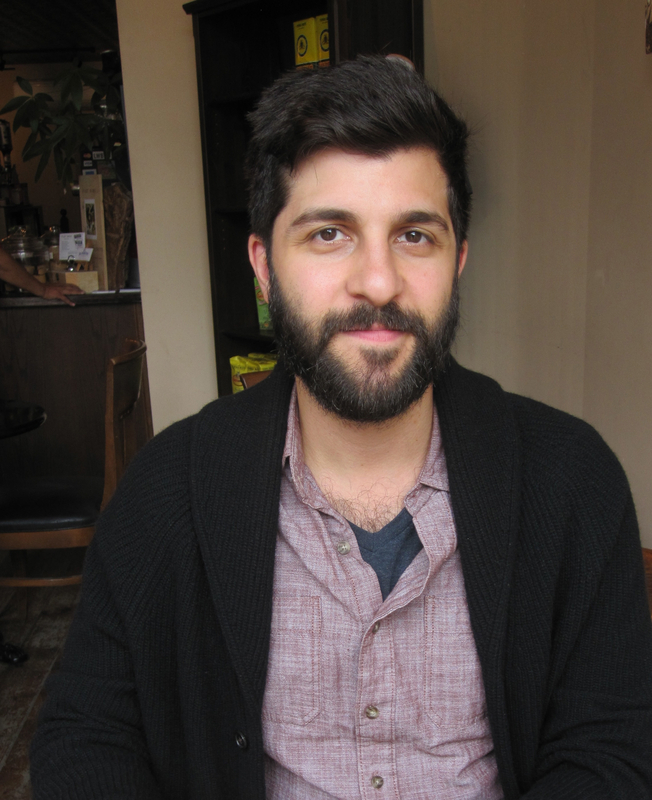 Anita Malhotra spoke with Adam Paolozza about his work on Friday, Sept. 20, 2013, at El Almacen Cafe in Toronto, three weeks before his new production of The Double was due to open at the Tarragon Theatre. AM: Where did your interest in theatre come from? AP: We went to the Epcot Centre when I was a kid – and I could have made this up later – but they have different pavilions from different cultures, and I think we were in the Italian pavilion – my background is Italian. There was a group of travelling players – masked players, like commedia dell’arte, and I’m pretty sure as a kid I was like, “Wow, that’s really strange and beautiful.” I think it left an impression on me. Later, when I was in high school in Whitby, Ontario, we had a really good drama program and our teachers exposed us to a lot of different things and we did some plays that were more movement based than text based. Then I went to the Ryerson Theatre School, and I always had in the back of my mind that I wanted to do something a little bit less conventional. Every year at Ryerson I had a teacher that had studied at the Lecoq School in France, and that was always my favourite class. One was a mask class, one was a mime class, one was a movement class, one was just an improvisation class. At the time, the Dean of Ryerson was an old Lecoq student as well, so I applied to the school and I got in. AM: What did your studies at the Lecoq School involve? 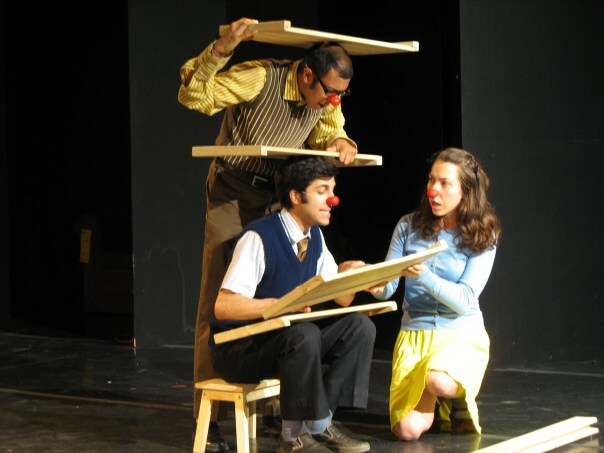 AP: People call it a physical theatre school or a mime school or a clown school but it was just a theatre school where Lecoq’s point of departure was looking at how the body moves and how that’s related to expressing all the emotions. And then how the body in space is related to the different theatrical territories, like comic ones, tragic ones. He was a really fascinating guy – a master. A big component of the Lecoq School is making your own work, so I knew that’s what I wanted to do. I didn’t come right back to Toronto – I made a company out of school and toured a bit. In fact, my company TheatreRUN started as an ensemble of five friends from Lecoq. One was from Switzerland, one was from England, and two were from the States. AM: You’ve said in the past that you strive to make theatre fresh and new. What did you mean by that? AP: It’s not really about innovation for innovation’s sake or for novelty, but I think what I’m interested in is always searching beyond the cliché, beyond the archetype, beyond the given sort of formal way of doing things. We all want to find something that’s real in the sense that there’s something really happening between the actors and between the design and the lights and the costume, that has a quality of originality in the sense that all these elements came together at this moment for this reason to express these feelings and these ideas. For example, The Double is very indebted to Charlie Chaplin, Buster Keaton and the Marx Brothers. There’s a certain comedic lineage that I’m very happy to identify with. But it’s also got other elements in it that I’m interested in, so I like this idea of a “palimpsest,” where you layer things on top of each other. 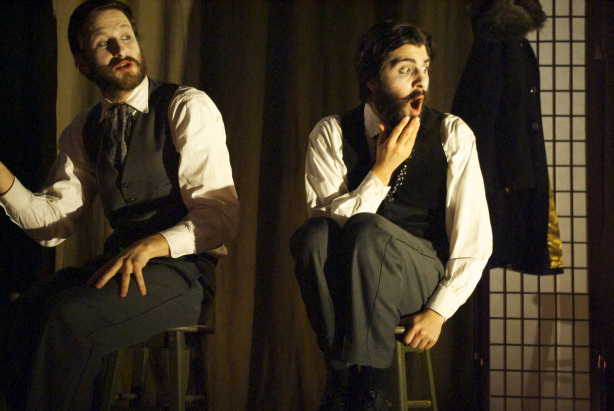 So you have Dostoyevsky, which is a literary source, but beyond literary there’s a whole other universe of associations that come along with his work, and on top of that the show looks like it’s in a rundown vaudeville theatre, so you have vaudeville. 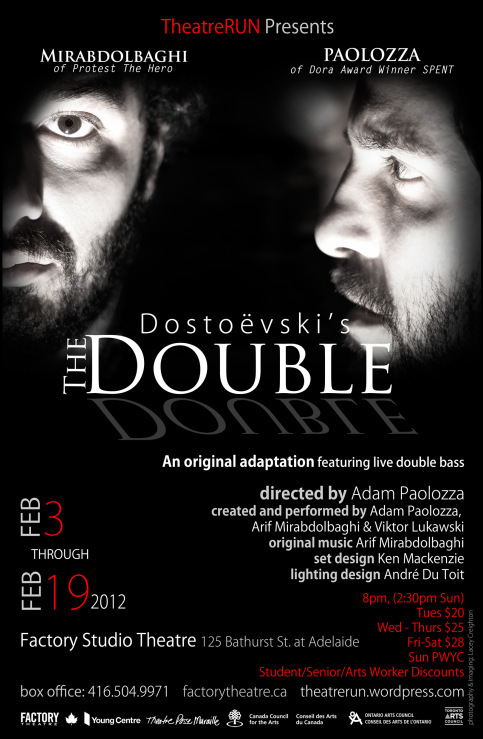 Poster for the 2012 production of “The Double” at Factory Studio Theatre in Toronto. 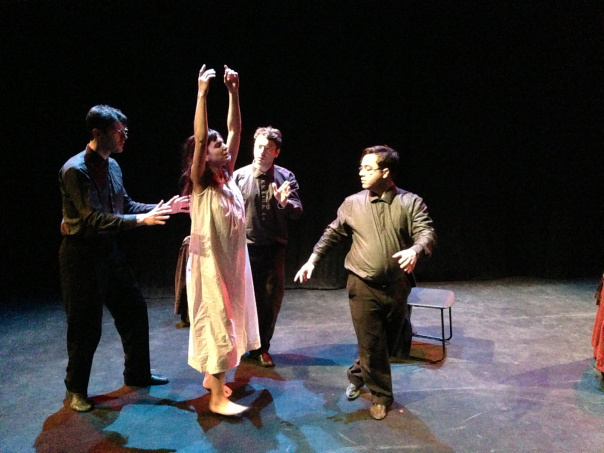 AM: What are some of the highlights of the early works you did with your company, TheatreRUN? AP: Two great things happened to us. One was we went to Edinburgh. Everybody who graduates from Lecoq wants to go to Edinburgh, especially if you have a lot of Anglophones in your circle, because it’s huge, there are people there from all over the world, and if you have a good show then you can really do something with that success. I was 25 years old when we went. AM: What was that show? AP: It was called Horror Vacui: A Terrifying Little Comedy. It was a modest success in retrospect. Edinburgh can be quite vicious and you can end up playing to three or four people – but we were usually half full to 75 percent full, which I didn’t realize was pretty good. The second show that we did, Russian Doll, got commissioned by a theatre in Seattle, so we all went to live in Seattle for three months. We had a full theatre at our disposal, which at the time I didn’t realize was rare. AM: How did your show Spent come about? AP: Ravi Jain and I started working together in 2008. First we were just friends. It’s nice to have somebody who has similar European experience. We wanted to make clown work because we felt like there was room in Toronto to do something interesting. So we made a show first called Tools, which was about clowns that try to put together Ikea furniture. And that was pretty successful at the Toronto Festival of Clowns. That was encouraging and we liked working together. So the next year, we put in an application to make a show. We wanted to talk about the financial crisis – Lehman Brothers had fallen in 2008. In Tools, we didn’t have a director and that was really difficult, so we asked Dean Gilmour and Michele Smith from Theatre Smith-Gilmour to direct it and write it with us. Everything came together and we made the show in about 10 days, which is very fast. It was really successful at the Clown Festival and then we did a run at Factory Theatre. We won a Dora award for acting ensemble, but we also got nominated for best production and best new play. Then we did another run and went to Edinburgh and it was completely sold out, so it’s had quite a life. I think it’s because it’s a mixture of clown but also bouffon, which is a satirical style that’s a bit more mocking. When we played the banker characters in Scotland and in the States, people would yell stuff at us and really have a visceral response, which is great. This coming season we’re going to tour it to Kelowna, B.C. and St. Catharines, and I think the following season we’re going to do it in the Yukon. AM: You have also done a French piece about Antonin Artaud. How did that come about? 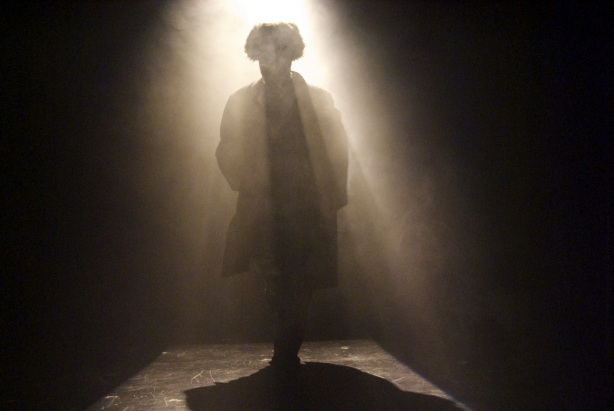 AP: My teachers in high school lent me Artaud’s book, The Theater and Its Double. Some of it was really esoteric and hard to understand, but fascinating and strange. And then when I was in France, I realized he was more famous in France as a poet, and he was a surrealist, and I’ve always been interested in surrealism. And we used some of his poems at Lecoq. We had a whole unit where we took poetry and tried to capture the dynamic of the words in movement. Artaud’s language is very apt for that. So I started collecting his books and by the time I worked on that show I had a lot of his books and was really into his ideas. I got interested in madness, too, because he struggled with that. 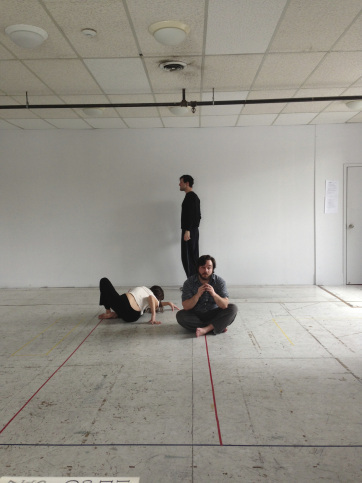 The French theatre in Toronto doesn’t really do stuff like that but I approached them and they helped me co-produce it and let me use their studio space for free. 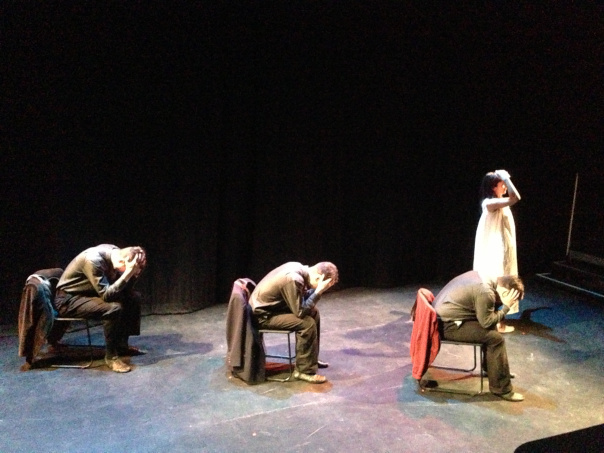 Then we did it again at the SummerWorks festival with surtitles and I got more of an English audience. It’s a very personal show and I don’t know if it’s found its definitive form yet, so maybe it’ll be something that I will work on again. AM: A lot of your time must be spent raising money for your productions. AP: Basically we’re always looking for a way to facilitate an idea or a project. You have to do that in Toronto unless you have another job and I don’t want to have another job. I teach a lot too, so that supplements my income, but we go for federal, provincial, municipal grants, and that’s quite an involved process. But then there are smaller pools of money that are more accessible directly from some theatre companies – they’re called theatre creators’ reserves – places where you can have seed money and start to develop a first draft of something. AM: Your piece Shostakovich, or 3 Days in Red, has no dialogue at all but just music, gesture and sound. What was it like to work without dialogue? AP: I’ve always been interested in mime, so I really want to pursue work that is driven by gesture, where the story comes from the body. Also this piece is sort of a dialogue with the music because it’s all set to a string quartet. Right now the piece is in development. We did a sketch for the Rhubarb Festival last year at Buddies in Bad Times. We worked on it for a week so it was very quick. So we’re going to work more with this one and pair it with another silent piece that uses Roy Orbison music. AM: How did The Double first come about? AP: Originally, the guy who plays the double bassist – his sister and my sister are really good friends. I always thought he was really cool because he’s in a really successful metal band, Protest the Hero, and tours all over the place. So I thought, “We should do something together.” And my sister said, “You know, he’s a big Dostoyevsky fan.” So I mentioned that to him – we both had beards at the time – and he said, “What about this one?” And he pulled The Double off the shelf and I thought, “Okay, that’s perfect. Double bass. Double. We look alike.” It just started like that. It was actually at Theatre Passe-Muraille at a festival called Buzz. They gave us a bit of money in the beginning to do a 20-minute version, and then later they gave us money to do a 45-minute version. And from there I got grant money and I did a production myself for 2012. That was pretty successful, and Richard Rose from Tarragon came to see it because I had pitched it to him. He liked it, and I got the Urgo Kareda Residency Grant at the Tarragon Theatre the next year, and as part of that we had three weeks to work on The Double. They really gave us dramaturgical support and we did it in Kitchener at a place called MT Space. 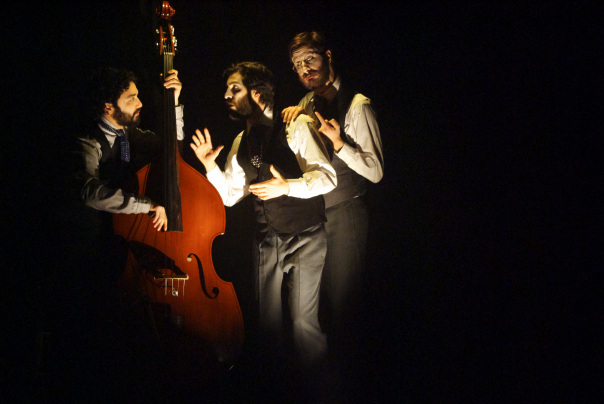 AM: What can the audience expect to see in the upcoming Tarragon production of The Double? AP: It’s about a mild-mannered, kind of dorky guy who wakes up and you’re not quite sure why he’s in such a state, and then little by little you discover that something has happened – there’s been some kind of incident in his life and he’s acting a bit strange but you don’t know why. And then there’s a man with a double-bass who’s narrating his life who seems to have some kind of strange power over him. It’s a world of mystery, very atmospheric, and always running against this almost supernatural kind of story, this thread of physical comedy also. There are lots of old fashioned smoke-and-mirror kinds of tricks of doubling, and the music is almost like another character – it can force the action in a certain way or it can stop the action. It’s also related to Artaud in that it’s about madness. It’s about a dark side but instead of tragedy it’s got that comic aspect. The Double, directed by Adam Paolozza and featuring Paolozza, Arif Mirabdolbaghi and Viktor Lukawski, previews Oct. 15-22 and runs Oct. 23-Nov. 15 at the Tarragon Theatre in Toronto. 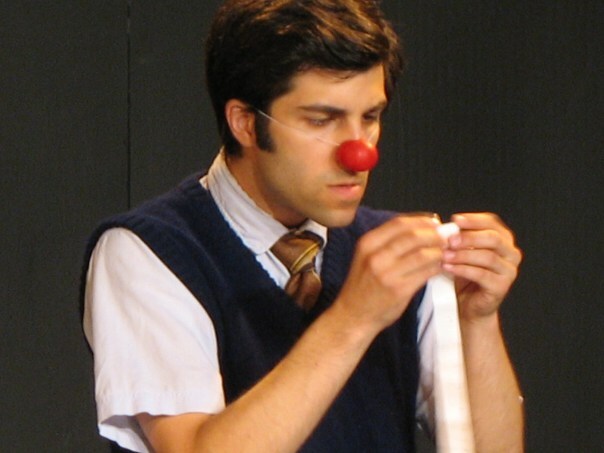 For more information about Adam Paolozza, please visit TheatreRUN. This entry was posted in THEATRE and tagged 3 days in red, Adam Paolazza, Adam Paolozza, Arif Mirabdolbaghi, Artaud, Artaud: un portrait en décomposition, comedia del arte, commedia dell arte, El Almacen cafe, Interview with adam Paolozza, Jacques Lecoq, Lecoq, MT Space, Play about Artaud, play about Shostakovich, Ravi Jain, Russian Doll play, Spent, Spent play, Summer Works, Summerworks, Tarragon, The Double, Theatre Passe-Muraille, Theatre run, Theatre Smith-Gilmour, Theatrerun, Three Days in Red, Tools play, Toronto clown festival, Toronto independent theatre, Toronto theater, Toronto theatre, Victor Lukaski, Viktor Lukawski. Bookmark the permalink.